With Democrats now firmly in control of the House of Representatives, it’s time for them to do what politicians with only one chamber of Congress and no control over the White House do. That’s a whole lot of nothing but masquerading. 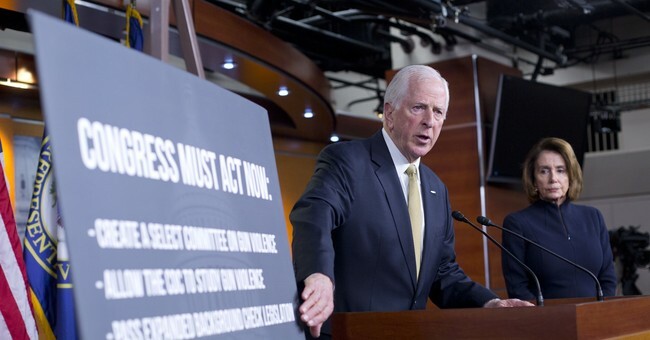 The House Judiciary Committee will hold a hearing on gun violence prevention for the first time in eight years, Rep. Mike Thompson (D-Calif.) said Thursday. Thompson, chairman of the Democratic Gun Violence Prevention Task Force, said in a statement that House Judiciary Committee Chairman Jerrold Nadler (D-N.Y.) announced the committee will hold the hearing next Wednesday. “The U.S. House of Representatives is finally taking action to prevent gun violence – our new majority is answering the call of the American people,” Thompson said. “For six years, our Task Force implored the previous majority to hold hearings and we were denied. This is a new day – we will have a hearing and we will get results. I am deeply grateful to Chairman Nadler for his leadership on this issue.… No longer will Congress be silent on this issue. Representative Thompson is the author of the universal background check bill currently under consideration in the House. Of course, anyone who understands how the government works knows this is nothing more than progressive kabuki theater. They’re putting on a show for the kiddies back home, to make them think they’re accomplishing something, while ultimately wasting taxpayer dollars on a farce that won’t accomplish anything. They’ll hold hearings, try to grab a few soundbites for their campaigns in two years, maybe try to make some of the other side look like idiots, and then preen about how proactive and on top of things they are. The problem for them is that they can’t do anything without the Senate on their side, and that’s not likely to happen. Yes, you have Sen. Marco Rubio (R-Fla.) proposing a red flag law, but you’re not likely to see universal background checks or “assault weapon” bans sailing through the Senate anytime soon. It’s just not going to happen. More than that, though, is that the House Democrats know it. They know it and yet they’re still pushing forward on this farce. They don’t care about saving lives. If they did, they’d be more open to comprehensive bills regarding public safety that have nothing to do with guns. After all, increased school safety that doesn’t include gun control should, in their mind, be better than nothing, right? So why do they continue to oppose them? It’s simple. These Democratic politicians don’t give a damn about people’s lives. While we argue that gun control makes people less safe, they oppose anything Republicans propose because it’s not gun control. That should tell you all you need to know. So the House will conduct its little Potemkin Village of a hearing, pretend it’s addressing the problem, and make nice with the folks back home. Meanwhile, they’ll continue to shoot down any proposal that might actually make people safer.